I've started working with Rob Ramsay, a pro modeller and animator. Over time we'll be replacing my animations. We've started with a 3 tile move animation. 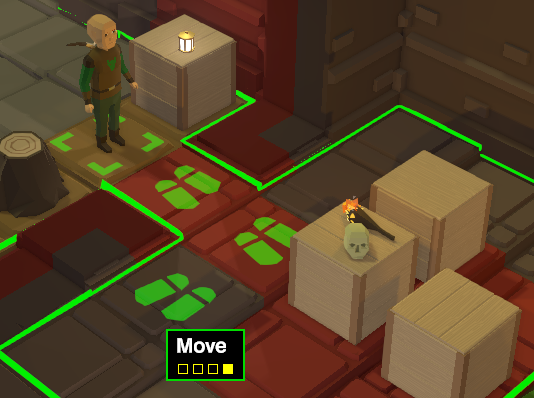 Characters can move 1, 2 or 3 tiles in a single action (and can do this twice in a turn). Previously I would play the 1 tile move animation for each tile, but this didn't look great, and was slow to watch. When moving in a straight line, 2 or 3 tile move animations are now supported. Humans have a first pass 2 step, and the new 3 step shown below. All animations are per race, so human only so far (fallback to repeated single steps). Not shown in the gif, but where floor tile levels are different, I'm using curves to add a subtle bounce effect for hopping up, or a drop down curve when moving to a lower tile. It's subtle, but very happy with the results. Previously I used my own lighting based on the light sources in the world, propagated around the tile map (so walls and doors blocking lighting). 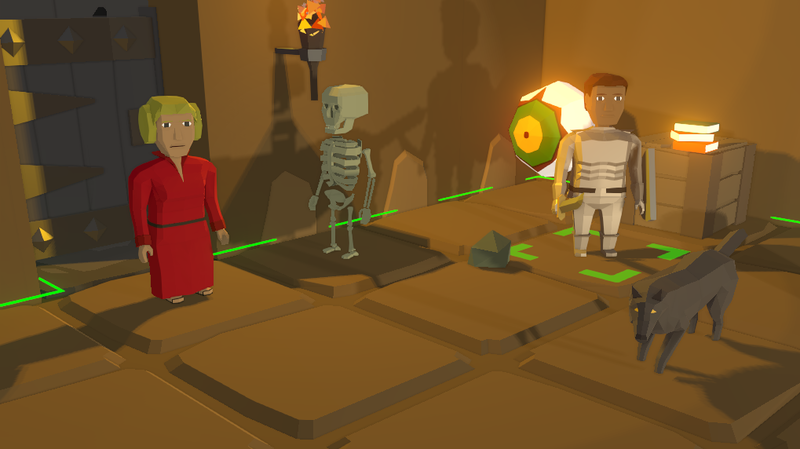 A shader then coloured the game objects based on this light map by adjusting the vertex colours. I used a couple of directional lights (parented to the players camera) to bring out the shapes/edges, with a 3rd directional light to provide top down shadows. The advantage of this system was I had full control (no bleed through walls) and could query the light map for gameplay mechanics (never actually used). The world had a very flat shaded look, which at the time I rather liked. I've been dissatisfied with this look for some time now. Due to the use of directional lights, for shiny materials I had to use extreme values for metallic and smoothness, and with multiple directional lights colours were always much lighter than intended. The lighting gives the scence dynamic soft shadows, with a warm look, much more interesting look. Would love feedback on this change - do you like it? Re: Tacticrawl | Real time lighting! looks awesome, feels like a great improvement! Long time without an update, but work has continued. The recent change to realtime lighting had the problem of light bleeding through walls unless shadows are 100% (ugly and harsh!) and I just could not have that! The solution was to break the map up in to 'rooms' and split these across Unity layers. Unity Lights can be set to ignore specific layers so that seemed like the best method. Unfortunately this is limited to 4 layers per light, so I have to first determine each 'room', then allocate layers maximising the distance between rooms on the same layer. 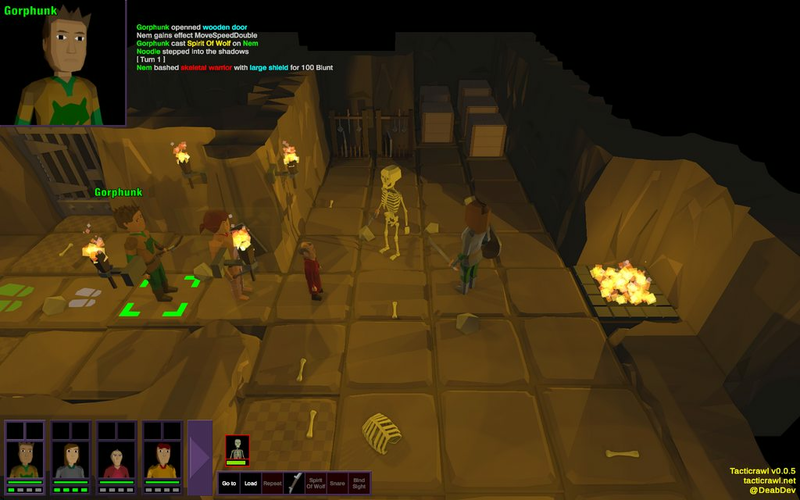 Walls and floors were previously separate GameObjects. They are now chunked together, split by room Id. A huge reduction in objects to render. With the above change, I'm now revealing whole rooms at a time, rather than tiles in view - removing the need for the old '?' tiles that indicated unexplored space. Rooms outside you current view are no longer revealed (other than doorways). Previously a 1 tile wide wall would mean you could see parts of open walls, which looked ugly and gave away room locations. Example in the gif below. Items in the world can now have a surface, upon which other items can be placed. The gif below shows the Map Editor, but the same UI is used in game for the player to place items. No more lanterns on the floor! To enable item's on top of other items, the map save format required a rewrite. I took the opportunity to start on a 'save' format that can be used for full save game files later. As the new format is based on object state, doors can now be set open or closed, and lights/fires lit state when designing a map. Mana added to the game, used by spells, gained every term. Force system received a pass, triggers damage, audio & movement when impact received. More spell/buff effect visuals added. First pass at character levels added. Large items (doors, trees) now match wall effect when blocking camera rather than fade effect (so now scaled down on Y axis). Texture layer added - planned to be used sparingly, I can now add textures to items and characters. Currently only used for wood (see crate in above gif). I've been working on equippable armour. Chest, legs, hands, feet and helm can all now show a base 'naked' part, an armour part, or both. The gif below is my test setup, adding 1 piece at a time, and finally switching weapons in. I'm not planning a loot heavy game, but armour does allow for player progression, and more variety in npcs. Why should all goblin warriors have exactly the same equipment? I'll be expanding the existing 'lootPack' system to include worn armour at spawn time, with percentage chance between pieces. Pawn armour added. Pawn mesh split to head, torso, legs, hands. Each can be different part. Armour database table added. Armour set contains male and optionally female parts for tosro and legs. Other parts always use male (unisex). Mecanim Humanoid fully supported, animations now mirrored at runtime. Grey Dwarf race added (uses Dwarf as parent record, sharing animations/armour). Many sound improvements, combat sounds pass. Pawn icons update when equipped items change. Mostly been working on engine related stuff (improved animation framework, audio overhaul, camera angles) but this week added a new spell! Wizard can summon a floating eye, granting vision as a player character would. Every turn the eye faces the nearest threat. Use to scout a room before entering, or as bait to draw out enemies. As the eye blocks its tile, also has a few other uses! Physics, Cinemachine, AI, And So Much More! For major actions I've replaced the old 'action camera' with a new, more dynamic 'director' system. This attempts to frame the shot with minimal objects/walls in the way, and priorities the front of characters. A number of different shot types are used based on the target(s). For the camera control (particularly the range/group shots) I'm using the new Unity Cinemachine system, and I highly recommend it. 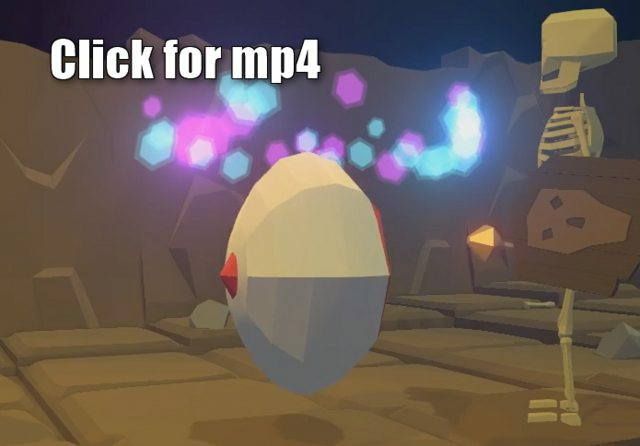 Items in the world are now physics enabled! Previously everything existing on a grid system - small items where 'bumped' along when walked into, but that was about it. 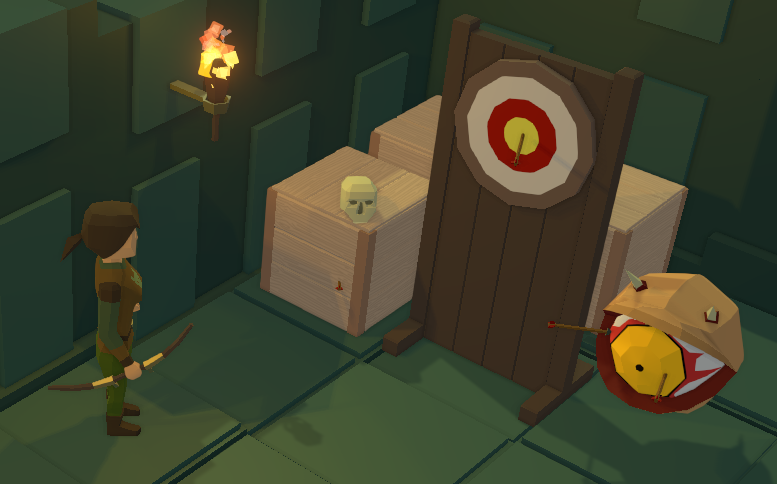 This was fine up to a point, but there were a number of issues: I couldn't stack more than 1 item; items could not be rotated; items above a character (eg on the wall) couldn't be targeted, you couldn't throw / shoot over low objects. And I wanted a much more interactive world! I could either expand my existing box based system vertically - a major complication, and would still leave a lot of issues - or switch to full physics for items. Still some work to do, but already the world is much more interactive, and a lot of possibilities are now opened up. I haven't yet touched on physics materials, or fully updated the damage system, but audio is hooked up, so items colliding triggers the correct audio. AI hasn't received a huge amount of attention, but has gained a few new abilities. AI can now throw items when out of other options in combat. 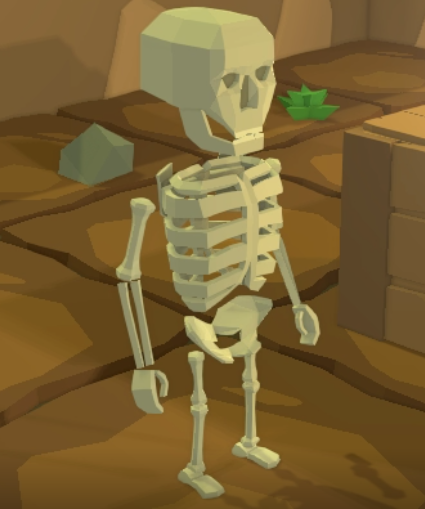 While testing throwing, I threw a bow at a skeleton and was surprised when, rather than throw it back at me, it picked it up and used the bow to shoot me instead I hadn't explicit defined this action anywhere, but that's the joy of system based design! Along with the above, audio is progressing really well. Our animation 'event' system (used to trigger audio and other effects) has been expanded to cover props, so a door closing can now include different sounds, and all based on the correct material. Lots of variety! A couple of new animations have been added (call for help, and an 'interact' anim for pick up/drop etc.) 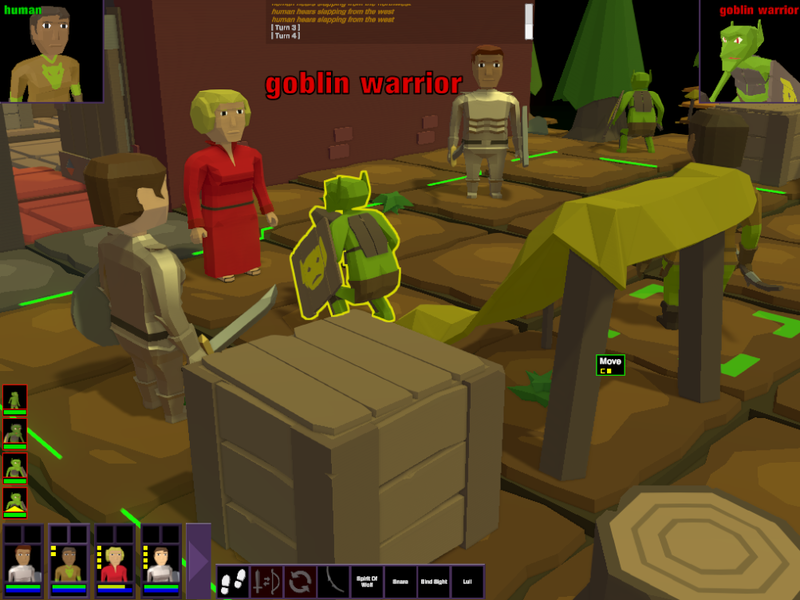 Animations also now have a timing feature, so a BLOCK animation plays in time with the ATTACK so both line up better. Re: Tacticrawl | An Arrow to the Eye! 2-handed props can now be equipped either hand. Character armour now reduces damage taken. Firing a bow now spawns an arrow Prop, uses physics. Pawns added multiple colliders parented to rig (allows more accurate character collisions, allows for arrow attaching). New props 'target board' and wooden panel (with hooks for other props). Projectile based abilities (currently ‘shoot’ and ‘throw’) results now based on physics result. For example, an arrow hitting but not penetrating target may damage another actor if hit hard enough. Working on UI at the moment. One of the changes is a new effect to show out of view tiles. Tiles not currently in view show a snapshot of the last seen state, including characters and items. I was using a checkerboard effect to indicate out of view tiles, but I've now replaced this with a more obvious, desaturated shader effect. Animations are also paused. I'm working towards a fully playable 2 level demo (with load and saving). Following some excellent feedback, I've started with overhauling the UI, following XCOM conventions where possible. I've simplified the move system. Previously you could move up to twice per turn, and each move 1-3 tiles depending on buffs/debuffs. You had 4 action points, but moving used 2.. there were good reasons for this, but it was just overly complicated. Characters now have 4 APs a turn, and 1 tile step consumes 1 AP. You are free to move as many times as you have points for (other actions also use APs). I still have buffs/debuffs that effect move 'speed', and the new system has much simpler code. A win all round. Completing the XCOM-a-like, maximum move range is now shown, and when the mouse is over a free tile, a live preview shown. Right click a tile to move. All ability icons (and the live move preview) also now show the APs used/remaining if the action/move is completed. Visual change also made to show the players FoV (I had a checker-board effect on floor tiles your characters couldn't see, but this wasn't clear enough). Out of view tiles are desaturated, and animations are paused. Move speed effects updated, MoveSpeedDouble now grants 2 ‘move APs’, used for first steps per turn. Shader based desaturate effect includes walls, floors and actors. Lull spell added for Ranger, reduces vision and disables hearing. Director (action camera) vastly improved results. Doors and door frame split to two props, updated for physics. Pawn animations now always run, but time speed up if not visible. Warrior Impale Ability rewrite, now applies force for a short period (allows items to slide along others). Colour pulsing effect added to Ability target previews, replacing outliner. Note that UI is all placeholder! Like the style you`ve chosen. Thanks, likely a few months away but I'm working on it! Quick update, but lots going on! Game state can now be saved/loaded. I've added a 'lobby' to manage your characters between dungeon runs - you can now choose which characters to take in (up to 4). Character (and items) now have a level, 1-50. This scales hitpoints and ability/spell values. Player characters now gain XP and can level up. Character levels unlock abilities - and I'm planning a lot of these so need to space them out. AI will also gain abilities at the same rate, so the game mechanics should really open out as you progress. Re: Tacticrawl | Still alive.. and moonwalking? Work continues I just haven't been updating, but a quick sneak peek as I think I've finished the character movement.. I've been keeping my head down this year and working away - and it's been a great year. 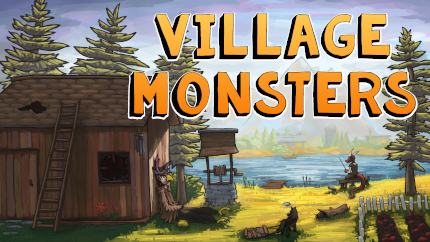 Graphical style finalised, game design coming together and major technical work completed. After years of iteration many systems are now considered 'final' - I do want to finish this at some point! 2019 should have much more of a content focus - which I'm very excited about! Here's the highlights for the last few months. Settlement - LUA controlled map building. Examples village, camp, caves. Rooms - building blocks for Settlements. 9 slice prefabs, allowing tiles and prop spawning. New editors added for each of above. Prep for larger maps, chunk parts (other than colliders) added on demand. Wall ‘capping’ redone, now drop below map, rather than squashed. Detail parts added at build time, will be expanded on to add variety. Pawn move animations changed to use looping set up. Easier to create and allows seamless multiple tile moves.